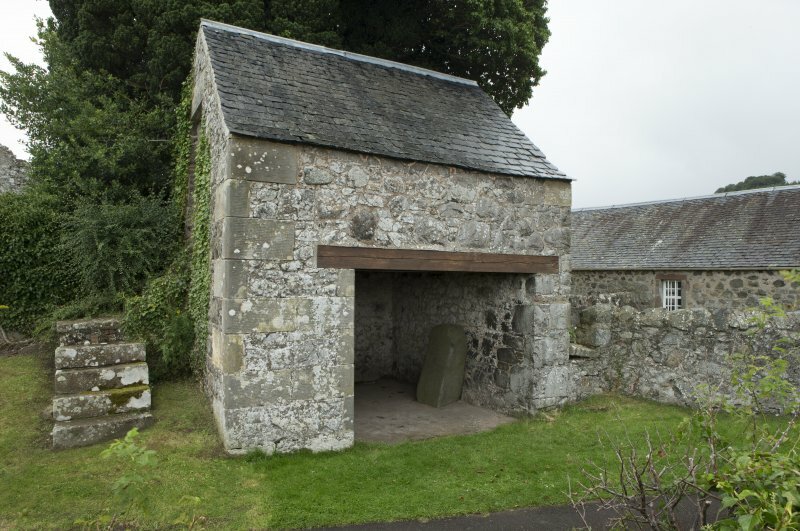 View of north face of the Lindores Stone, Abdie Churchyard. 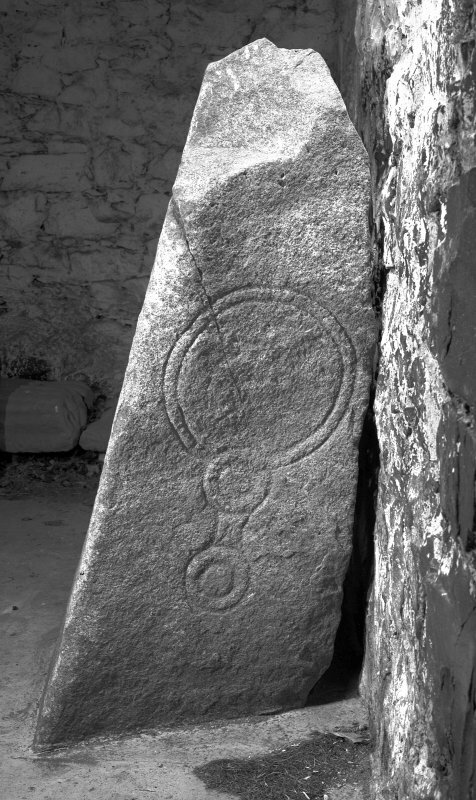 The Abdie, or Lindores, symbol stone. From J Stuart, The Sculptured Stones of Scotland, i, pl. 102. West face of symbol stone showing the mirror. 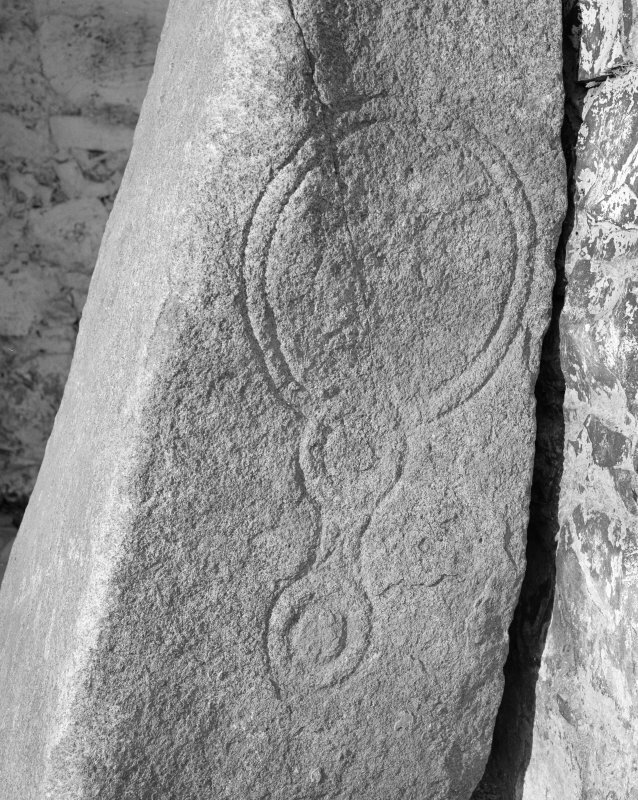 North face of symbol stone showing triple-disc and bar above a crescent and V-rod. Detail of west face of Lindores Stone, Abdie Churchyard. 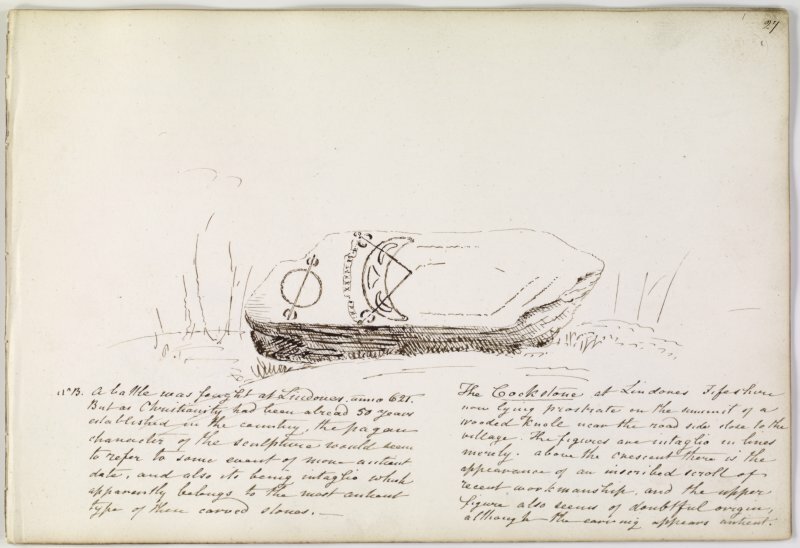 Annotated drawing of symbol stone from album, page 27. Digital image of FID/389/1/P. 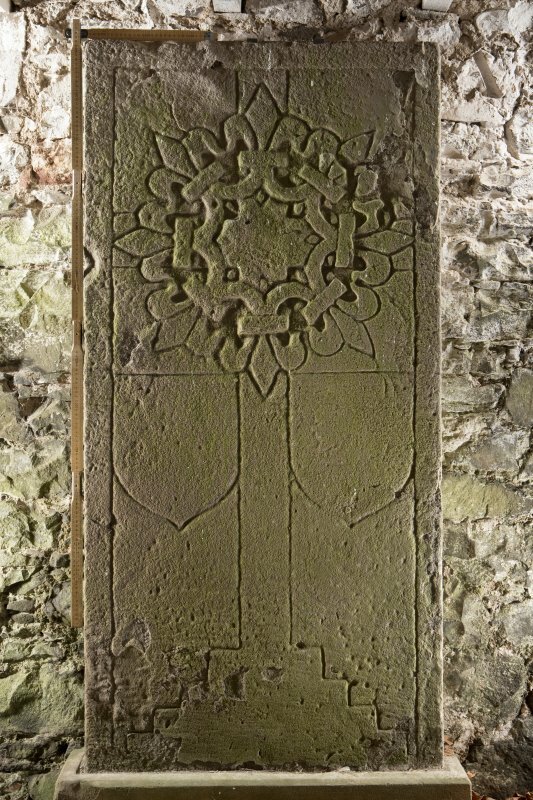 Present location: in the Old Mort House at Abdie Churchyard (NO 2595 1633). Evidence for discovery: first recorded around 1830 lying fallen on Kaim Hill above Lindores village (Skene). Sometime in the next two decades it was built into a garden wall in the village (Stuart), and in 1970 it was taken to Abdie. 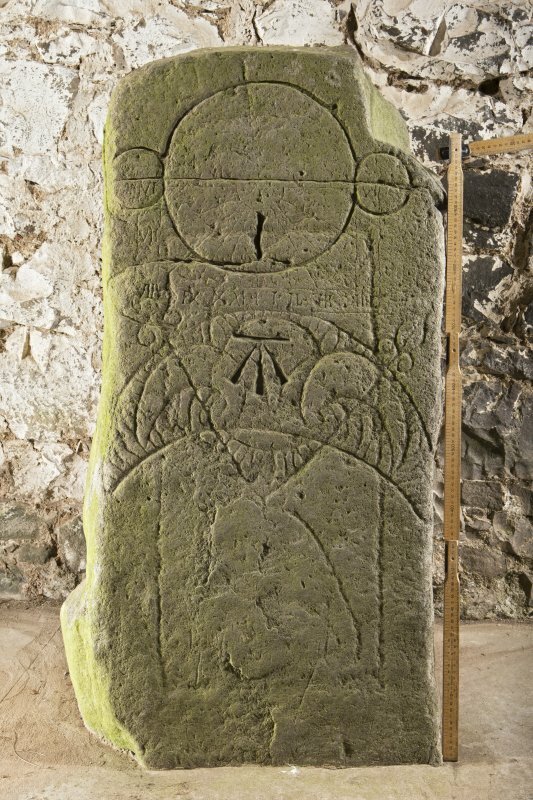 This large natural block of stone is carved on two faces with Pictish symbols and later designs. 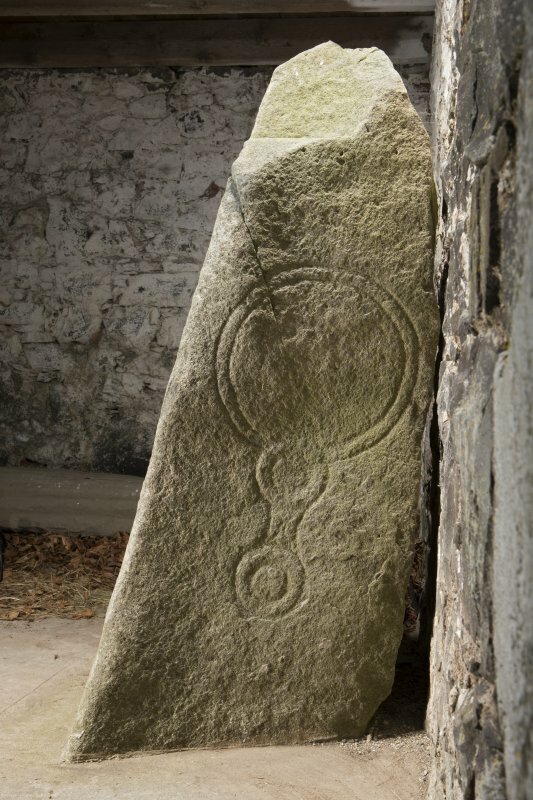 On the broad face A there is incised a triple disc symbol above an ornate crescent and V-rod, apparently superimposed on an earlier rectangle. On face B there is a large incised mirror symbol with and double-disc type of handle. In later times, the straight line across the triple disc has been used as the top of an incised rectangular sundial, and later still an Ordnance Survey bench mark has been carved within the crescent symbol. References: Skene 1832, 17; Stuart 1856, 32; ECMS pt 3, 343-4; Ritchie & Ritchie 1982; Fraser 2008, no 78. A symbol stone, which originally stood on the crest of Kaim Hill (Name: NO 2620 1698), has been built into the garden wall of a nearby cottage. It measures 4' high by 1'10" and has been defaced by a bench mark, and the large central disc of the upper symbol has been slit by the hole which took the gnomon of a sun-dial; the divisions of this, and Roman numerals, can also be seen. A curious additional feature is a shallow pecked line following the outline of a rectangle which can be detected running across the lower half of the upper symbol, down through the extremities of the crescent and across the bottom of the face wall below the latter. This outline appears to have been cut by the symbols, but an intensive examination would be necessary before its exact status could be accurately known, and whether the symbols have been to some extent re-cut. RCAHMS 1933; R B K Stevenson 1955; R W Feachem 1963. This stone was removed during repairs to the retaining wall in which it was set in the summer of 1970. 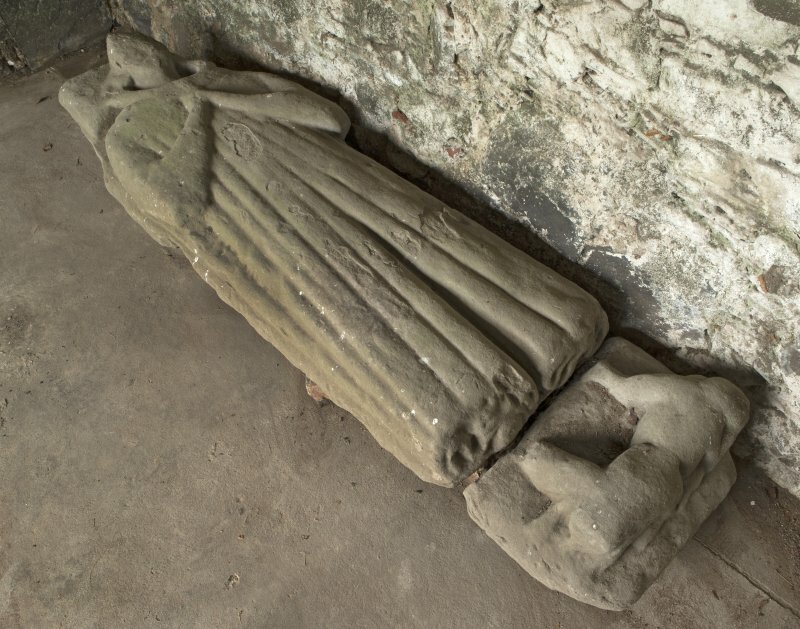 It is now lying in an outbuilding of old Abdie Church (NO21NE 8). Removed to the old Mort House inside the entrance to Abdie Churchyard (NO 2595 1633). 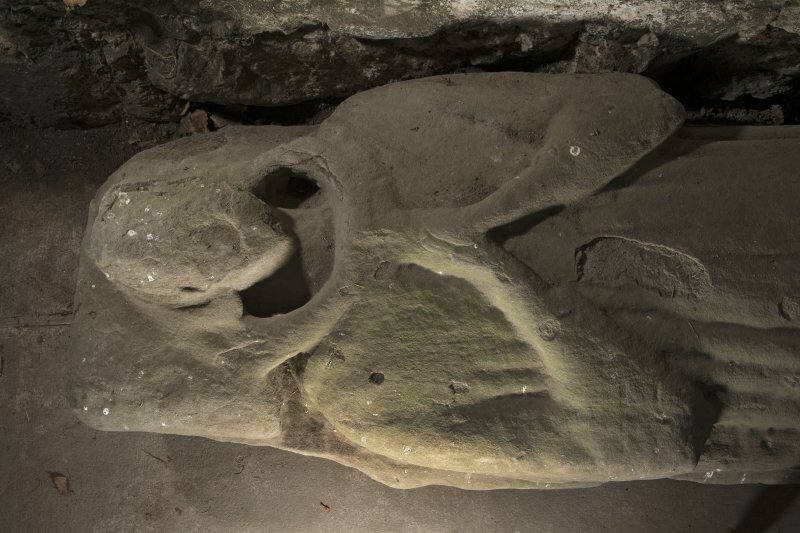 It was discovered to be larger than previously thought, 5ft 6ins x 1ft 10ins wide x 1ft 3ins deep, and with a tapered base. 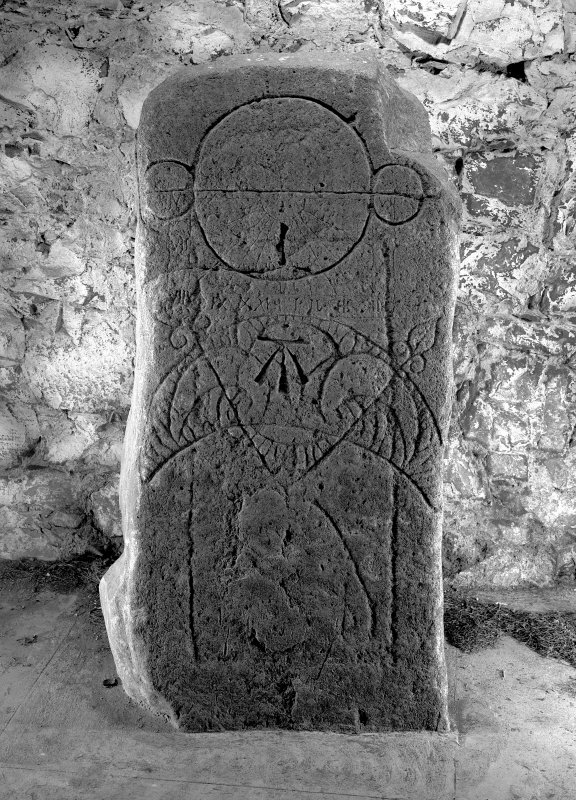 Symbols were discovered on the previously-hidden face. It is being re-scheduled on its new position. Information from SDD (I A M) 7 December 1981; photographs A2780-1-6. 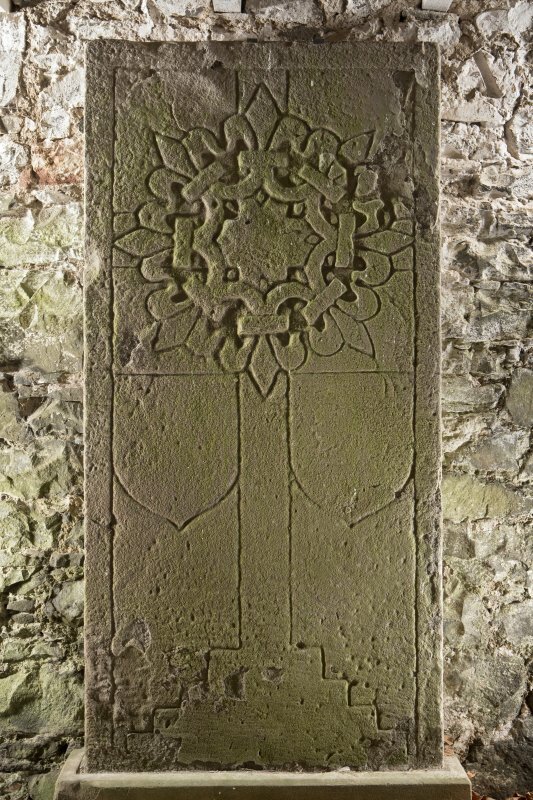 This stone originally stood on the crest of Kaim Hill (c. NO 262 169), but was then moved to a garden wall at Lindores, and subsequently (in 1970) moved to the Old Mort House at Abdie Churchyard. 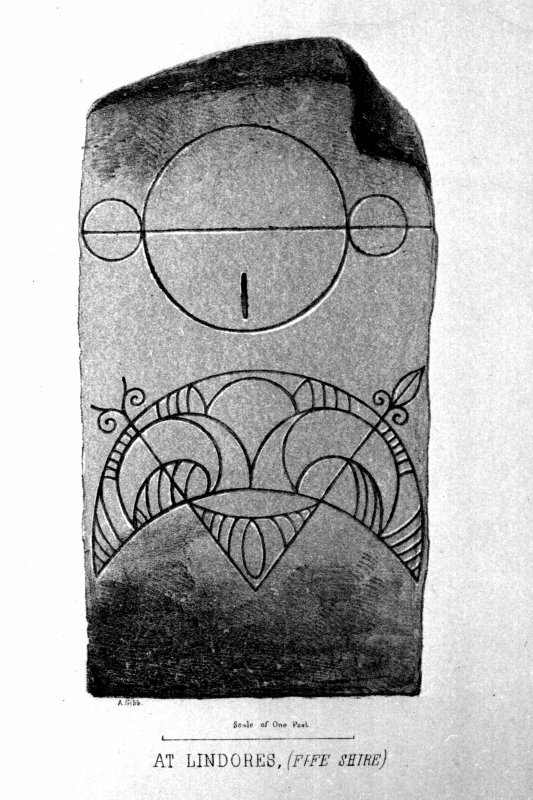 The stone (1.67m by 0.55m and 0.37m thick) was then found to be decorated not only with the triple disc symbol and crescent and V-rod symbols noted by Allen (J R Allen and J Anderson 1903) but also with a mirror on one side. The stone also bears a sundial and benchmark. Symbol stone - as described above. Visited by OS (W D J) 13 May 1970. 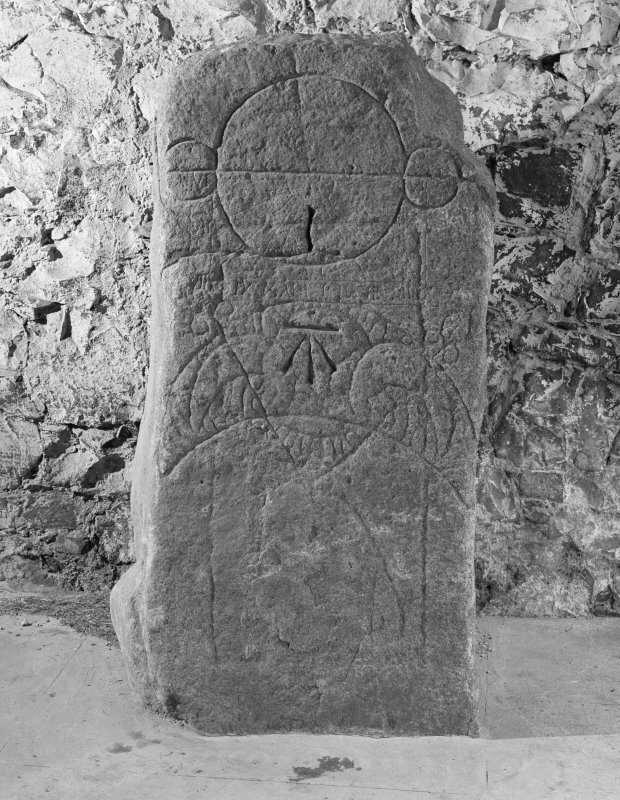 The stone stood originally on a low hill above the village ofLindores and was there converted in recent times into a sundial with Roman numerals. It was also found convenient for a bench mark, the three-pronged symbol carved beneath the rectangular sundial. 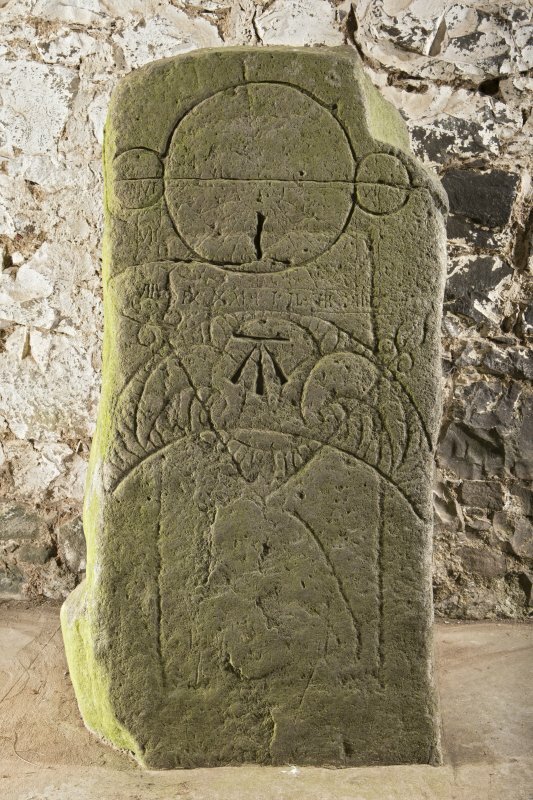 Traces of a large rectangle suggest that yet another use for the stone had been considered, and the sequence of carvings from Pictish times onwards is a graphic reminder of the many functions for which simple stone monuments have been used. The three original Pictish symbols are particularly well carved, especially the crescent and V-rod with its effective decoration. Above the crescent is a triple disc or cauldron symbol, here shown with a medial line to represent the chain by which the cauldron hungi the line was later adopted as the base line for the sundial. The back of the stone is undecorated, but one side bears an excellent mirror symbol. Class I symbol stone: on the face is a triple-disc above a crescent and V-rod, and on the reverse face a mirror.